We want to turn our attention briefly to a view of the Reformed Church of Norka. The parish Norka with the branch Huck. The first colonists came to the site of Huck on July 4, 1767* and founded the colony; they were followed on August 15 of that year by the colonists of the community Norka. The former consisted of 77 families - about 300 souls - the latter some 204 families - about 800 souls of both sexes. Initially the newcomers built mud huts, where they spent their first winter and some inhabited them even longer, but in the next year ordinary wooden houses were built by the Crown (Russian government). Right from the start Norka enjoyed a wooden church, a parsonage and a schoolhouse. In the beginning, Pastor Johann Heinrich Fuchs sometimes came to the colonies, where he dispensed Holy Communion, but since the community was unable to make a firm offer to hire him, he took the place of a Reformed preacher in Jaroslaw. Pastor Johann Georg Herwig was hired in 1769 as the first resident pastor of Norka. He died after twelve years of hard work on April 29, 1782 at age 69 years. The church records show that during his tenure of office he baptized 700 children in Norka and 241 children in Huck, married 121 couples and had buried 217 people. His successor was Johannes Baptista Cattaneo from the Canton Graubünden** in Switzerland, where he was the preacher. He entered the pastor’s office in Norka on the August 31, 1784. In 1791 the congregation bought an organ for the Norka church, which had been until then in the Castle Church in Barby,*** which today is not one of the worst in use in the colonies. Pastor Cattaneo managed his ministerial office with much dedication for 44 years until 1828, but had been supported since 1817 by his son Lukas Cattaneo until March 1821, when the younger Cattaneo took over the parish of Beideck; but at the beginning of 1828 he was appointed pastor of the parish Norka because his father was unable to manage the office. However, the younger Cattaneo was constantly ill and died on December 21, 1828 of consumption. His father lived until January 16, 1831, when at the age of 85 years and after a full life he succeeded to eternity. From 1828 onwards Norka was served by Pastor Emanuel Grünauer, pastor of the parish of Messer. On March 18, 1830 a candidate to the ministry, Friedrich Börner from Riga, filled the position of regular pastor. Castle Barby in the 1800s. Image source: Wikimedia Commons. In 1822, the second wooden church was built in Norka, and on October 15, 1822 General-Superintendent Huber inaugurated the church. The church is still being used today. In Huck, until 1832, there was only a prayer hall. Since this was not sufficient, the congregation built a spacious church, and on October 16, 1832 Provost Conrady inaugurated it. Pastor Börner followed a call in February 1841 to the imperial arms factory of Kamsko-Tschewsky as preacher; after eleven years at various parishes in meeting the afflictions of individuals, he became a pastor at Ekaterinburg. 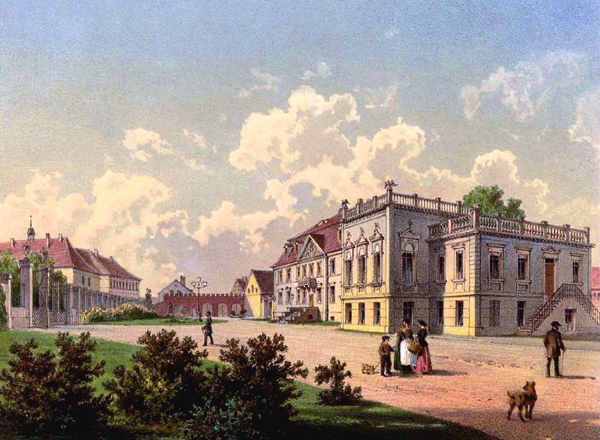 For a couple of years the Norka pastorship remained unoccupied and the congregation was served by Pastor Hegele of the parish of Beideck until the beginning of July 1845, when pastor Christoph Heinrich Bonwetsch, from Württemberg, was appointed by the parish. He came to Norka from Tbilisi, and on July 15th was introduced by the provost Conrady and the Consistory. The number of students from 7 to 15 years old was 642 boys and 600 girls in Norka in three schools with one teacher; 517 boys and 499 girls attended school in Huck. The 1,016 children of Huck were taught by two teachers. The students were taught reading, catechism, biblical history, writing, arithmetic and choral singing. **** Since settlement of the colony of Norka, 800 souls grew to 6,650 and about 1,200 more settled in the next twelve years in the new colonies in Kamyshin and in Samara Province. The colony of Huck grew in the same time from 300 to 4,760 souls and about 100 migrated to new settlements. *Dr. Igor Pleve gives the date of July 1, 1767 for the founding of the colony of Huck. **Graubünden is a Canton in southeastern Switzerland, situated between present day Austria and Italy. ***Barby was a town and district in Prussia, 14 miles northwest of Dessau and 15 miles southeast of Magdeburg. Today, Barby is located in the German state of Saxony-Anhalt on the Elbe River. According to a Geographical Dictionary published in 1840, Barby had an academical college founded by the United Brethren (also known as the Unity of the Brethren or Moravian Church) in 1754. ****These are church schools, which accounts for the religious subjects. Materialien zur Geschichte und Statistik das Kirchen- und Schulwesens der Evangelisch-Lutherische Gemeinden in Russlands, (Materials on the History and Statistics for the Churches and Schools of the Protestant Church in Russia) by G.H. Busch (St. Petersburg: G. Haeffel, 1862), published for the Central Committee of the Support Fund of the General Consistory of the Protestant Church in Russia, states each school in Norka had a teacher, with 437 students in the first school, 312 in the second school and 339 in the third school. Dalton, Hermann. Geschichte Der Reformirten Kirche in Russland: Kirchenhistorische Studie. Trans. William Pickelhaupt. Gotha: R. Besser, 1865. Print. Last updated February 2, 2016.